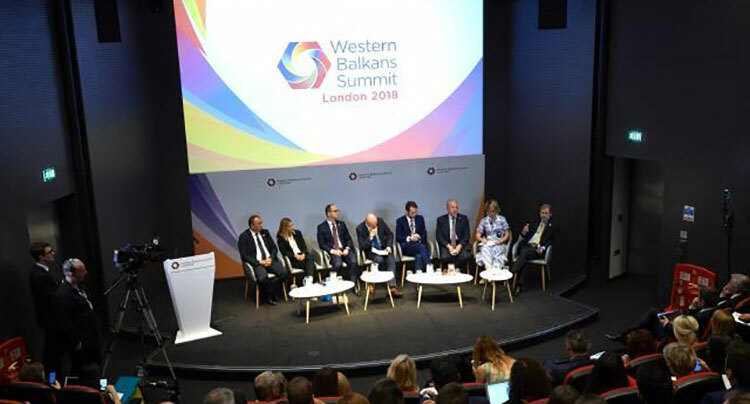 At the London Summit on the Western Balkans, the EU is continuing to strengthen cooperation with the region, with a clear commitment and concrete measures, focussing on the three key areas of cooperation: economy, security and reconciliation. Heads of Government, Foreign Ministers and Ministers of Interior from the Western Balkans together with their counterparts from several EU Member States and high-level EU representatives are meeting yesterday and today in London to continue strengthening regional cooperation between the six partners of the Western Balkans, as well as between the region and the EU, to further advance the European integration process of the Western Balkans. Johannes Hahn, Commissioner for European Neighbourhood Policy and Enlargement Negotiations, and Commissioner for the Security Union Julian King are also attending the summit. In the area of socioeconomic development, the focus will be on the further implementation of the action plan to establish a Regional Economic Area as agreed in Trieste last year, which aims at boosting the attractiveness of the region to encourage investment and foster trade, thereby creating jobs. One year into the implementation of the action plan, the region has already witnessed an uptick in intraregional trade. Discussions will also cover digital skills, as a follow-up to the Digital Agenda for the Western Balkans adopted in June in Sofia. Participants will consider ways to step up financing for SMEs and start-ups, including through the mobilisation of non-banking financing. They will also exchange on the need for the region to engage in its energy transition and better exploit the substantial hydropower potential in the region in a sustainable fashion. To support these objectives the European Commission, in cooperation with partner financial institutions, is putting forward a new guarantee instrument that will be launched in early 2019 under the Western Balkans Investment Framework. With an initial EU commitment of up to €150 million in 2019-2020, the guarantee will aim to leverage up to €1 billion in investments into sustainable socio-economic development and regional integration. The guarantee will allow sharing financial risk to unlock private investment in a broad range of sectors such as start-ups and SMEs, climate finance and infrastructure investments, as well as digital and social sectors, thus tackling key bottlenecks hampering access to finance in the region. Yesterday, leaders already looked into ways to deepen cooperation in addressing shared security challenges, including fight against terrorism, radicalisation, cyberattacks, organised crime and firearms trafficking, between the Western Balkans and the EU. The summit will be an opportunity for increasing cooperation among law enforcement agencies in the Western Balkans, including on information sharing. The link between corruption and security was discussed and representatives of the Western Balkans reiterated their commitment to tackle corruption. Regional cooperation and good neighbourly relations are at the heart of the countries’ path to the EU, which also entails achieving lasting and sincere reconciliation. Ministers will exchange views on bilateral and legacy issues such as war crimes and missing persons. The EU supports the involvement of Western Balkans youth – youth cooperation is key to increase regional connectivity – in many EU projects, such as the Marie Skłodowska-Curie Actions, the Creative Europe and Erasmus+ programmes, and the Youth in Action window animated by the South East Europe Resource Centre (SALTO). Furthermore, the Regional Youth Cooperation Office (RYCO) will present its latest achievements and its Strategic Plan 2019-2021 for promoting reconciliation and cooperation between the youth in the region.